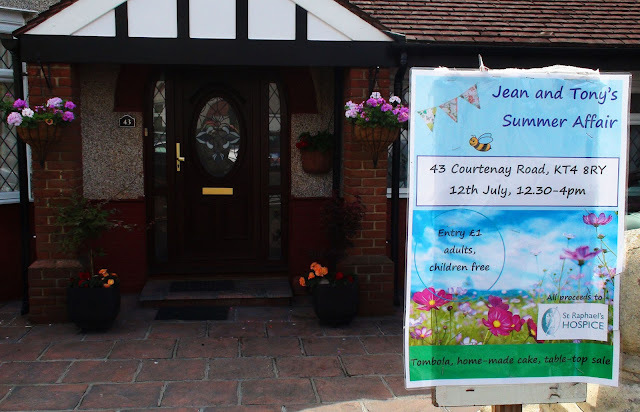 Two year ago I happened upon the most amasing charitable local event: Jean and Tony, at 43 Courtenay Road had turned their back garden into a summer fayre event to rival those of many schools churches and other institutions. They have been opening their home to the public like this, twice a year for around 7 years now, in order to raise money for St Raphael's Hospice - a very important local charity. Each year sees a Summer Affair in July and then a Christmas one in December. They spend a great deal of their own money, time and effort during the year preparing for these events, helped by family and friends. And the results are astonishing. They have managed to raise close to £1000 each event for the charity in recent years and have actually hit the mark a couple of times. It only costs £1 to get in and is well worth it. Being a private home, the feel of the event is more like a friendly garden party than a fund raising event. There are prizes to be won, cakes and other yummies to enjoy and many bargains to be had; but overall it is a very pleasant afternoon to just go along and enjoy.